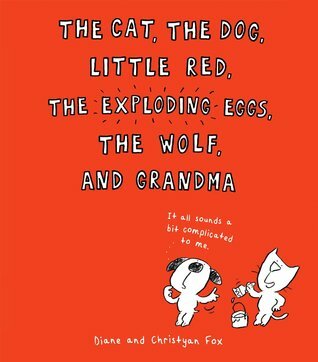 A comical twist on “Little Red Riding Hood” told by Cat and Dog! So let’s see if I have this right. The Red Hood is on her way to help an old lady when she meets the Wolfman. He has an evil plan. He likes to dress up in girls’ clothes and eat people. He and Red have a big battle and Red’s father puts an end to Wolfie. Children who are familiar with the Little Red Riding Hood will be laughing at the absurdity of taking a fairy tale literally as I was. But even those who don’t know the tale, or are too young to understand the misinterpretation, will enjoy the interaction between Cat and Dog. This is not a picture book but it does have cute comic book style sketches on every page along with the text, which is also in comic style above the head of the character that is speaking. There is also a little lesson in the story about not interrupting and paying attention to others, and is delivered with a fun dose of humor. And maybe a lesson there for adults too! Sounds cute and I love the title! The title and lettering remind me of a Dr Suess book. Looks fun! Sounds like a great book for little ones!! And I agree with Sheila, it reminds me of Dr. Seuss! This sounds adorable, Leslie! I’m glad you enjoyed it. Fun! Probably too much for Gage quite yet though.